In large bowl, break up cookie dough. Stir or knead in flour until well blended. Reshape into log. If too soft to cut into slices, refrigerate up to 30 minutes. Heat oven to 350°F. Cut dough into 16 (1/2-inch) slices. To make stem, at top of each slice, cut out small pie-shaped wedge. Push dough together where wedge was removed to reshape slice. On ungreased cookie sheet, place slices about 2 inches apart. Place wedge piece, pointed end out, to form pumpkin stem at top of each slice. Bake 12 to 14 minutes or until edges are light golden brown. Cool 1 minute; remove from cookie sheets to cooling racks. Cool completely, about 20 minutes. Spread frosting over cookies. Sprinkle generously with orange sugar. Frost stem of pumpkin with green decorating icing. Draw mouth and nose on cookies with black decorating icing; place 2 chocolate chips on each cookie for eyes. 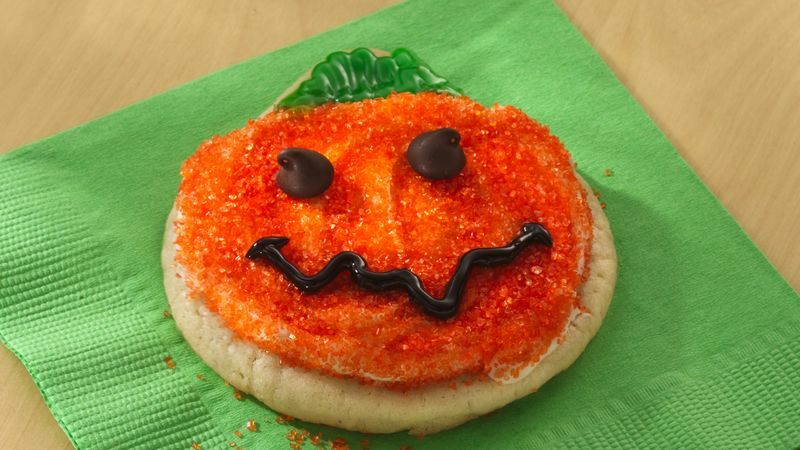 Use a strip of green fruit snack roll for the stem of this cute cookie.